How does Rick and Michonne deal with the loss of their son? The follow-up episode to Carl's death, The Lost and the Plunderers, left them scrambling to fill the running time moreorless. Left with Alexandria to sizzle until the early morning, the duo tried their best to salvage one of Carl's hang-outs before their home was overrun by walkers. Taking their last vehicle out to the Trash Heaps and recover what was left of their alliance, they didn't find what they were expecting. What happened to Grammatically-Incorrect leader and her people? Despite Negan's strict instructions to leave her people alone and Simon knowing her compound has solar panels and a helipad (sure, they won't need those things at some point), Captain Hook's twin brother took matters into his own hands. ( We were given a clue that Rick's vision of a helicopter so many episodes ago might actually be true if Jadis has a working helicopter at her compound.) After antagonizing her to give a heartfelt apology for betraying the Sanctuary, he was thoroughly unsatisfied. Her admissions of remorse weren't enough, so Simon and with cronies shot everyone down. Left alone and watching her group turn into walkers, she sat on a mound of trash while Simon went back to the Sanctuary and pretended he didn't go against Negan's orders. Eventually, Rick and Michonne attempted to meet her. Unfortunately, because Jadis liked to play both sides of the war and thought she was untouchable, pleading with the couple to help her out of the wasteland was fruitless. Not learning from his past mistakes again, Rick repeated the same tactics with Siddiq from the season premiere. Fending for herself, she ended up leading her former group into a trash compactor, clearing out her home from the dead but with an exceptional amount of walker meat. Will Jadis become the Mrs Lovett of the apocalypse? Nothing is honestly too far-fetched now. The Lost and The Plunderers honestly didn't have too much going for it. Rick and Michonne's relationship faces their biggest test next to Negan and simply surviving in the apocalypse. Michonne began considering Carl's last words. 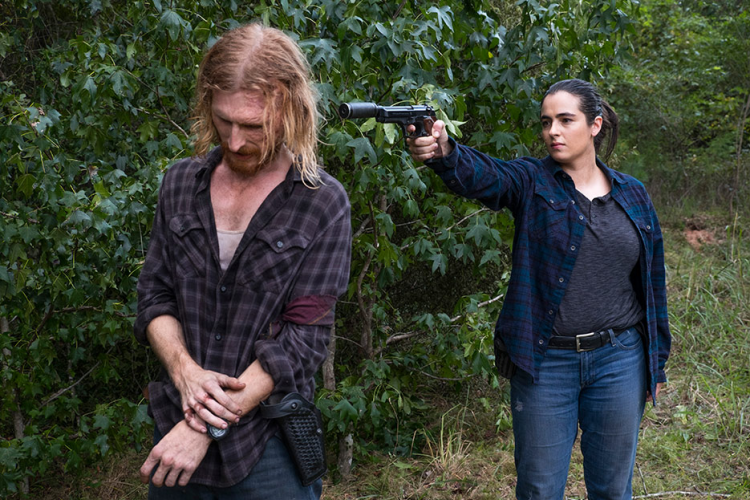 Even Enid was squeezed into the episode as we briefly caught up with her and Aaron at Oceanside; they were allowed to leave but Aaron stayed in an attempt to get their help against the Sanctuary. But there wasn't a lot to digest except for a stale bit of breadcrumbs of how other characters are going to accept Carl's motivations. Additionally, trying to reinforce why Rick will eventually forgive Negan was practically fruitless. Using a walkie talkie to the Sanctuary, he told his nemesis that Carl was dead, and the laughable set-up included Rick admitting to Negan that it was an unfortunate accident that Carl died; it wasn't because of Negan's people and Rick is still going to try to kill Negan anyways....because why, at this point? Not being able to use Carl for his own brigade only opened up Rick to take more cheap shots from Negan: Grimes set this course, failed his son as a father and a leader, and can end this war by just surrendering now. It'll happen, it's just going to take until the season finale. The episode itself sprinkled in tiny details that might make one emotional about the show's choices in the past: Rick and Michonne burying Carl in Alexandria; Rick leaving Carl's gun on his cross before removing it for the rest of the battle; Jadis was stripped of her identity and has to start all over again or find a new group; Rick and Michonne's relationship from entering Alexandria to leaving it behind was completely paralleled in this episode to past seasons, including the fact that the airing date of The Lost and the Plunderers was the one year anniversary of Say Yes - yes, their honeymoon escapade. The amount of suffering they've endured continually hits us in the feels. The war is still going on, it's just going to take until the season finale for it all to make sense or to re-insert any importance outside of Rick reeling from Carl's loss. Trying to cover their tracks and update us on the rest of the communities, Dead or Alive Or flipped between the different groups to show their whereabouts, and nothing else was too exciting about it. To start off with The Hilltop Colony, Carol and Morgan holed up with Maggie's people and Henry, who is fastly becoming Carl 2.0. Though Maggie has earned the reigns of her community, things aren't looking good. As her camp took in refugees from the Sanctuary to be left out on the parameter to basically die-off because rations are becoming too low for all of them, she had to contend with whether to use them as resources or not; to trust some of them to help her out as Carl believed might happen. This all led up to Alexandria showing up on her doorstep to rush through telling them Carl was dead (POOR ENID); and ended with his adoptive parents telling Henry that Gavin killed his brother, so he has to decide what to do. Meanwhile, Gabriel's faith with Dr. Carson was tested. After going out on the lamb after the Sanctuary, his infection continued to worsen. Strapped in a-middle-of-nowhere-miracle-shack, the symbolism continued to rack up as everything worked in their favor for the duo: they found a radio system (a la Terminus), car keys, and antibiotics (which eased Gabriel's fever but couldn't stop him from going blind). Even though Carson almost lost his life to falling into a bear trap and getting surrounded by walkers, Gabriel saved him with what little sight he had left. Eventually their good luck, or faith, ran out as Saviors caught up with them. Carson went to grab one of the Savior's guns but was shot immediately. Gabriel's literal blind faith led him straight back to the Sanctuary in Eugene's factory, sorting bullets. Even though we lost the doctor, Siddiq's medical experience just replaces the latest red shirt. Because isn't that what everyone is now? "We were in trouble," she says. "We were trapped. Glenn didn't know you, but he helped you. He put himself in danger for you. And that started it all. As Maggie is running The Hilltop Colony, she is now realizing the conundrum of providing for everyone in the middle of an apocalypse. At the end of season seven, Maggie gave an emotionalspeech about how the apocalypse's band of survivors started: with Glenn reaching out to Rick even though he didn't know him. And, that's somewhat how the rest of the family united. With rations running low but more than enough hands on board to help them out of the weeds, Maggie finally realized it might be a good idea to put the prisoners to work - they'll get the same amount of rations, they'll be under armed guards, but that might just help everyone get a fairer shake. While I don't agree that Negan should be kept alive, because that's hardly doing a service to anyone's memory, it is striking that Maggie (a woman caught in a man's war over ego) is the first one to take steps in foraging a future (to be honest, it might not have anything to do with Carl and just who she is and continuing to follow Glenn's lead). There's already a lot of casualties in this war, and the remaining few might earn more fan-favor over longtime survivors. Dwight, and a few of Maggie's prisoners, are still trying to prove their worth. 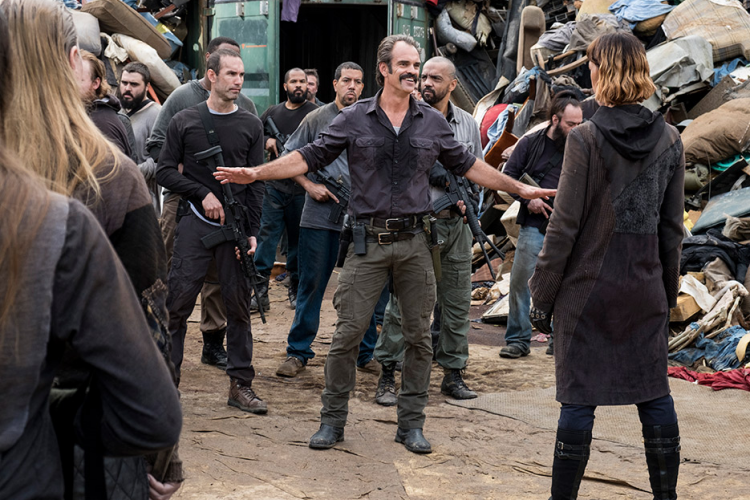 The former in particular tried to help several times in haste to help Alexandria get the upperhand, but unfortunately his plans (the All Out War on Rick's territory) fell through. This time he helped Daryl and the Alexandrians arrive to the Hilltop. Even though Tara pulled a Shane and lured Dwight away to kill him, he still stuck his neck out when the Saviors found their hiding spot. Dwight revealed himself to protect them and went back to the Sanctuary; he'd rather be dead than back at the Sanctuary, to be honest. His usefulness will continue because he learned that Negan wants to turn the other community's warriors into walkers and string him along the Sanctuary borders. How is he going to tell them of Negan's plans? He'll certainly try to implement a warning, hopefully before Gimple catches a whiff of his usefulness and kill him off. Up until now, barely, the show has struggled to divide the lines between which antagonists are willing to save and who can be killed off. For the most part, as far back as taking in Governor's survivors from Woodbury, people have been a resource. The only problem now is that Negan has exploited this secret to surviving for his own benefit and pissed off the wrong communities. Now, because we're assuming the season is leading up to a future where peace has been partially achieved, the road now is less about who will get vengeance on Negan and how they can use him or his people for the betterment of everyone.